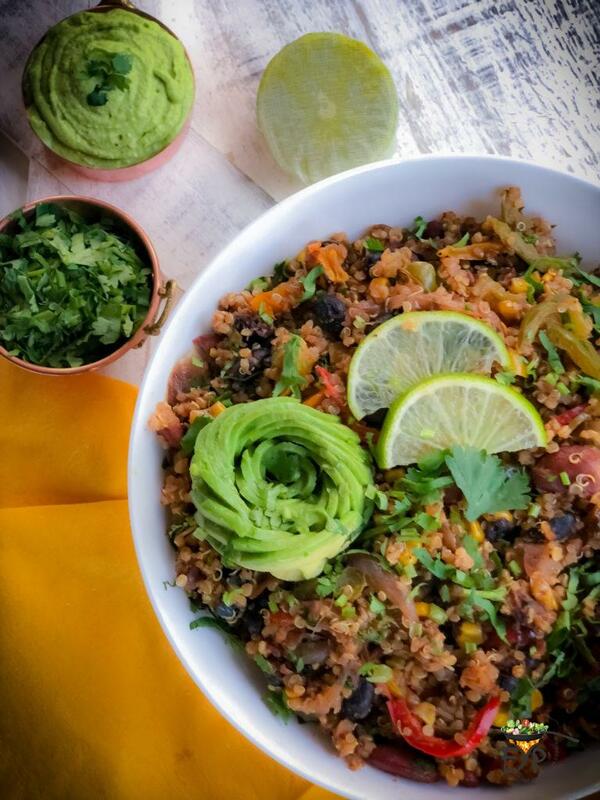 Mexican quinoa recipe is a flavorful savory recipe wherein cooked quinoa, and beans are stir-fried with some vegetables and spices to create a deliciously healthy protein and fiber rich recipe. 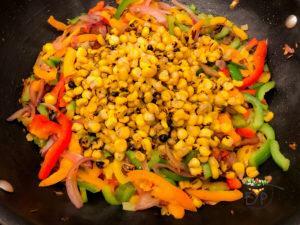 This recipe is gluten-free and vegan which makes it attractive to a large fraction of population. I have packed this recipe for kid’s lunches, husband’s work lunches, picnics and also used it for our interim meals during long travels. It also makes a perfect pot-luck recipe. You can also use this for a small plate snack or after school snack for kids. 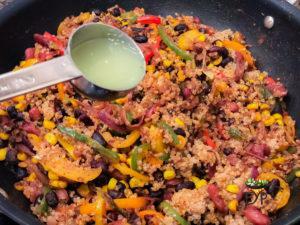 In general, I am always trying to switch from rice to quinoa to add more quinoa in my family’s daily diet. 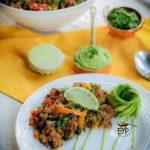 Previously, I had made Mexican fried rice in a similar fashion for some events in my home, which everyone loved. 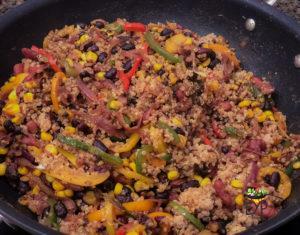 So, this was an attempt to re-create same mouth-watering flavors using quinoa, the current times super grain. Each serving of this recipe has only 350 kcal, but provides 14 gm of protein and 13 gm or dietary fiber. 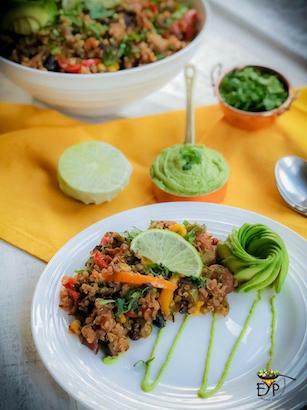 This nutritional enhancement is achieved by using beans and vegetable (predominantly peppers) along with quinoa in this recipe. 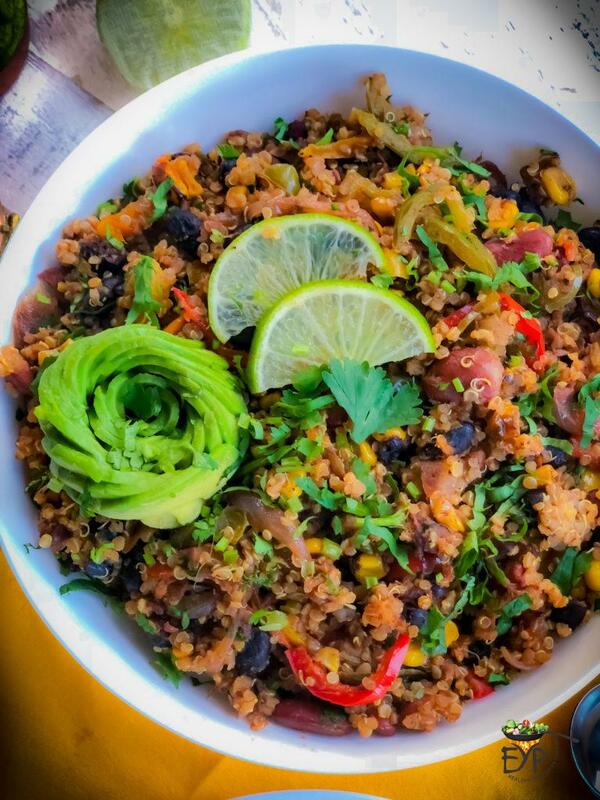 Quinoa has much lower amount of carbohydrates, compared to the same serving size of rice, and at the same time has much higher plant-based protein content with all 9 amino acids. It also has low glycemic index for help controlling blood sugar and high in anti-oxidants. 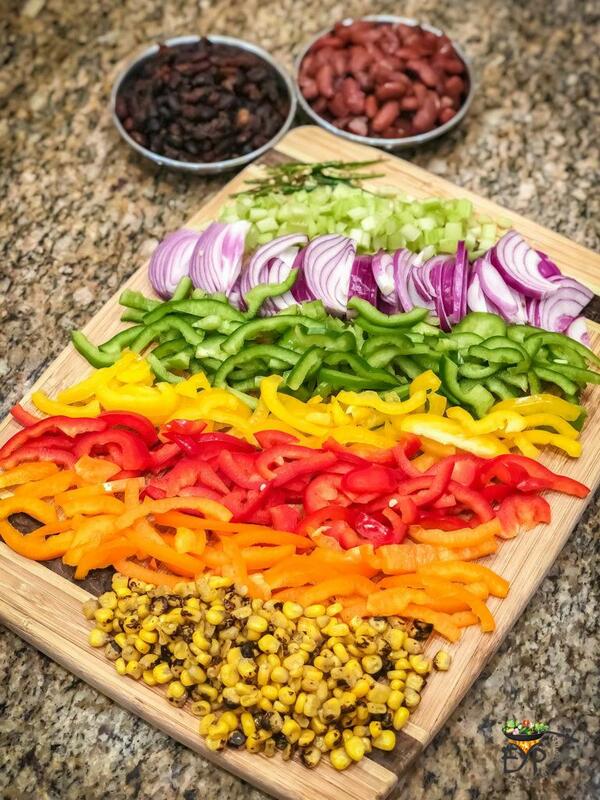 Both kidney beans and black bean also a rich source of protein, fiber, folate and essential minerals like iron, magnesium, copper, etc. 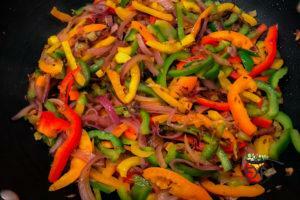 Combining peppers with iron source helps with absorption in addition to other nutritional benefits. Now a days lot of people carry Instant Pot when they are travelling for long vacations. So, you can very easily make this recipe in IP as well. To make it quick in IP, I would first make quinoa in instant pot and use canned beans. 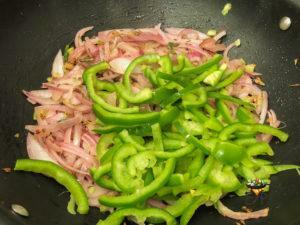 Then, just use the sauté mode to stir fry as per the recipe below. Heat around 1 tbs of oil in a wok. Add 2 stalks of chopped celery; sauté it on high for a minute. 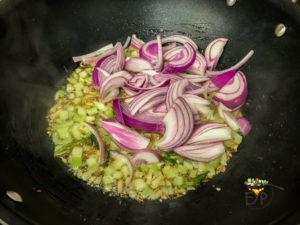 After that add slices of half of medium-sized onion, sauté it. Don’t let it cook too much maintain the crunchiness of vegetables. 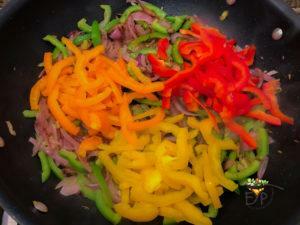 Add half of each color julienned peppers( green, red, yellow and orange) you can use whatever color peppers you have in hand. Sauté all of them on high maintaining the crunchiness. Add around frozen corns and stir. 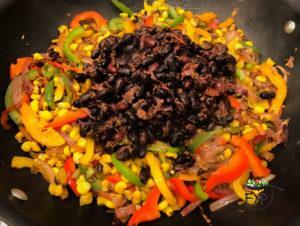 Add boiled and drained black beans ( you can use canned also). Give a good stir. 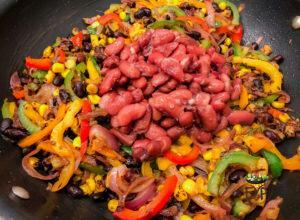 Add boiled and drained red kidney beans ( you can use canned also). Give a good stir. Add all the spices. I used 1 tsp of lemon pepper spice mix and 2 tsp of taco seasoning if you don’t have theses seasonings you can add salt, red pepper flakes, chilli powder, roasted cumin powder, black pepper and 1/2 a tsp of sugar stir everything. Add 1 cup of cooked and fluffed quinoa. 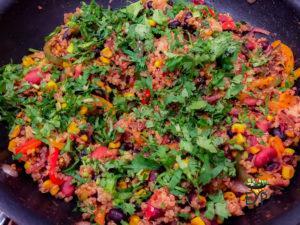 At the end add lime juice of half lime and handful of chopped cilantro into quinoa and combined everything. 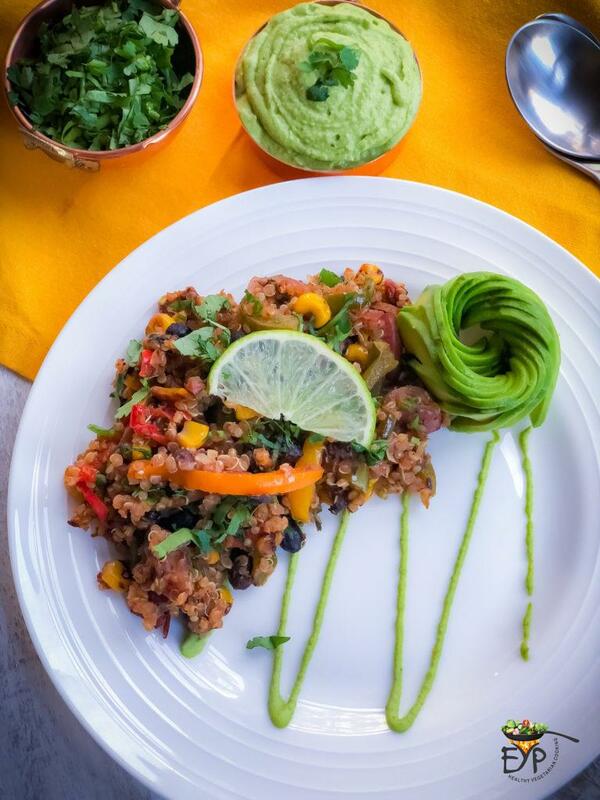 Your Mexican quinoa is ready to serve with sliced avocado and enjoy. Please leave a comment if you try this recipe to let us know how it went! 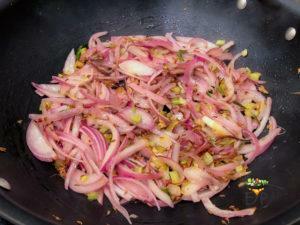 After that add slices of half of medium-sized onion, sauté it. Don't let it cook too much maintain the crunchiness of vegetables. Add all the spices. I used 1 tsp of lemon pepper spice mix and 2 tsp of taco seasoning if you don't have theses seasonings you can add salt, red pepper flakes, chilli powder, roasted cumin powder, black pepper and 1/2 a tsp of sugar stir everything. Tried this today.. Turned out delicious. It was an absolute delight..
How to cook and fluff quinoa ? 1. On stovetop 1:2.5 quinoa to water ratio on low to medium heat covered with a lid ( add little salt and ghee) keep stirring in between around twice for even cooking. Takes around 20-25 minuets. Once done ✅ all water is absorbed by quinoa, switch off the heat and fluff it using fork. 2. Directly in instant pot, 1:1.25 quinoa to water ratio. Add washed quinoa to inner pot add water little salt and ghee, put the lid back on closed position, make sure valve is on sealing, press manual/pressure cook button, cook for 4 minutes with NPR at the end. When pressure pin drops down fluff it with fork and transfer to serving bowl immediately. 3. In IP pot in pot method, add quinoa to a Stainless steel pot which can fit inside the main inner stainless steel pot of IP. Add one cup of water in the main pot then put a trivet inside the main pot and quinoa pot on top of trivet with in that. The ratio should be 1:1.5 between quinoa and water. Put the IP lid back on closed position. Check the valve should be on sealing position, press the pressurecook/manual button. Cook for 6 minuets with NPR. 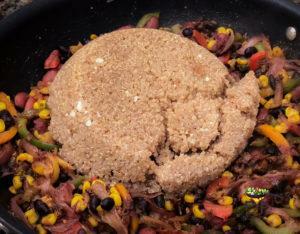 When pressure pin drops down take out the quinoa pot fluff it with fork and k serve. Thank you Kiranmai for trying and leaving your feedback. I am so glad that you liked the recipe. Thank you ? Delicious. Easy to make. Great idea to bring to a party. Glad you liked it, thank you!! !